Pimples, Cysts, Whiteheads, and Blackheads. Painful back acne affects everyone, young and old. It starts out with an itch, then another itch and before you know it your entire back is broken out. What happened? Many things cause Back Acne, mainly hormones. Puberty, clogged pores, and most recently people adding additional hormones to their body, known as hormone replacement therapy. At the LED Skin Care Center we have seen a rise in Back and Chest Acne among women in their 40’s who have started hormone replacement therapies. They love the way they feel but are very frustrated with the side effects from the hormones – acne. 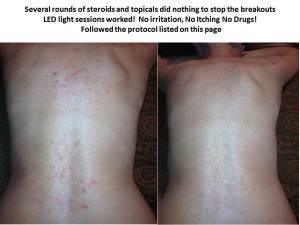 *An LED Skin Care Favorite! LED Skin Care Plano “Members” get 10% off their Dermalogica products. At the LED Skin Care Plano we take a non-ablative, non-toxic, no downtime approach towards skin care and get great results. Tell your doctor immediately if you have any of these unlikely but serious side effects: mental/mood changes (e.g.,depression, aggressive or violent behavior, and in rare cases, thoughts of suicide), tingling feeling in the skin, quick/severesunburn (sun sensitivity), back/joint/muscle pain, signs of infection (e.g., fever, persistent sore throat), painful swallowing, peeling skin on palms/soles. Isotretinoin may infrequently cause disease of the pancreas (pancreatitis) that may rarely be fatal. Stop taking this medication and tell your doctor immediately if you develop: severe stomach pain, severe or persistent nausea/vomiting. Stop taking this medication and tell your doctor immediately if you develop these unlikely but very serious side effects: severeheadache, vision changes, ringing in the ears, hearing loss, chest pain, yellowing eyes/skin, dark urine, severe diarrhea,rectal bleeding.